From the Anderson Daily Bulletin, April 26, 1969, this photo by Jim Carroll gives an example of the work done by the MCHS's Cemetery Conditions Committee before there was a cemetery commission appointed and funded by the Madison County Board of Commissioners. 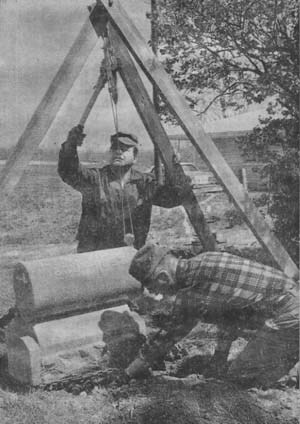 Everett Huntzinger and Howard Clark, standing, are shown working at the Capp-Tucker Cemetery in Adams Township. As explained on the pioneer history page, old city and some family and church cemeteries were taken over later in the 19th century as part of associations whose business was burying the dead. The old pioneer sections were then maintained and preserved as part of a larger sacred park. However, many pioneer cemeteries were not that lucky. Included in land still controlled by private individuals in the 20th century, the Cottrell, Norris, Pennisten, and Hardy-Culp were destroyed or vandalized for profit or convenience. 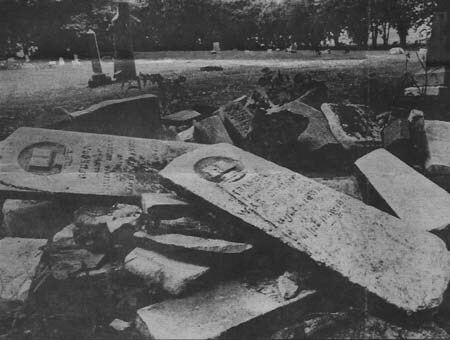 They are examples of the cemetery desecration which gave rise to public outcry and the passing of Indiana state laws in 1973 protecting pioneer burial grounds. Even before the '73 legislation, the Madison County Historical Society had established a Cemetery Conditions Committee in the mid 1960s. The committee had taken a pro-active approach to the dilapidated state of county pioneer cemeteries and had already improved the Capp-Tucker, Kisling, Mt. Carmel, Melson, Duck Creek, and Keesling. Workers on this committee were W. Lloyd Scott, Mrs. Everett Huntzinger, Mr. and Mrs. Durbin Hollingsworth, Loree Cross, Howard Clark, Martha Haines, Mrs. Glen Tyson, Elizabeth Worland, Frank Rogers, Mr. and Mrs. Harris Coy, Helen Baumer, Mr. and Mrs. Charles Dittlinger, Adeile Cunningham, Claire Mowrey, David Hayward et. al. 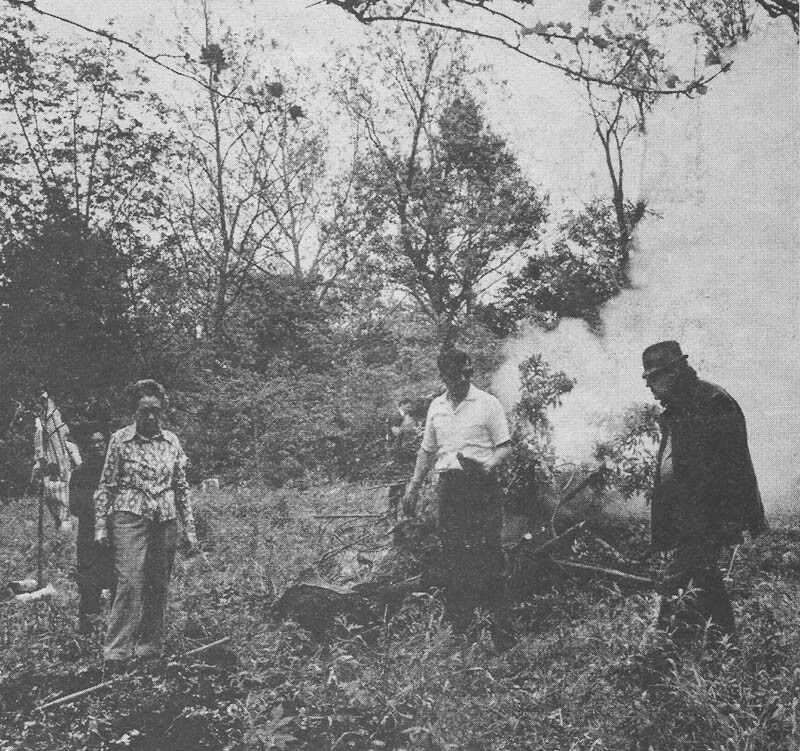 At left, is a photo from the May 28, 1974, Call-Leader, showing volunteers clearing the Duck Creek/Carr/Ray/Frazier Cemetery in Pipe Creek Township. Participating in these efforts were Phyllis Hart, Mr. and Mrs. Clyde Cross, Sarah Eaton, Mr. and Mrs. Vic Phillips, Betty, Kathy, and Terri Sanders, Mr. and Mrs. Cecil Hensley, Ralph Reavis, Jennie Huntzinger, John Brundage, James Kaster, and Mr. and Mrs. Benson Zile. In November of 1969, cemetery committee members began collecting cemetery records and researching cemetery history. Efforts were made to rediscover "lost" cemeteries and map all cemeteries in the county. Records were gathered from the Daughters of American Colonies, the Daughters of the American Revolution, the American Legion, the 1876 atlases, personal reminiscences and letters, the Veterans Administration, the Works Projects of America, funeral directors, surveyor's office, the Conservation Department, and deed records. When all else failed, committee members transcribed gravestone inscriptions or sought out local amateur genealogists and historians who had already made lists of the buried. Glen Walker, Archie Roberts, Ray Davis, Robert Dwiggins, Hazel Kendall, Betty Sanders, Ada Dickey, and Mildred Alatza are some of those earlier 20th century historians who are to be credited with helping to preserve Madison County's pioneer legacy. Their efforts and the dedication of the Cemetery Conditions Committee were the beginnings of the Tombstone Records Database used by the Anderson Public Library and this web site. The vandalism pictured here is just one of the types of desecration that prompted protective laws. 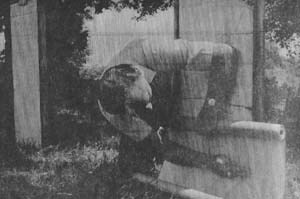 From the Friday, July 16, 1982, Anderson Herald, the photo by John Cleary headed the article "Vandals may be chief threat to old cemetery" by Rick Kirby. Statutes within the law also guard against destruction by residential, commercial, and industrial development. "SECTION 1. Public Policy. Many of our older cemeteries are without funds or sources of funds for reasonable maintenance. This condition has produced neglect and deterioration. Many of these cemeteries hold pioneer leaders of our state as well as veterans of every American war including the Revolutionary War. Civic Pride and basic citizen respect should prompt us to remedy this condition. "SEC. 2. County commissioners are hereby authorized to appoint a County Cemetery Commission of five county residents who may request a levy of an annual tax to a maximum of five mills per dollar upon the general tax base of the county for the purpose of restoring and maintaining such cemeteries established in the respective counties before 1850. "SEC. 4. County Cemetery Commission members shall be appointed for a term of five years..."
Specific laws were then outlined. If a cemetery is still part of private property, as the Broyles is, owners cannot move, change, or destroy graves or the earth within the cemetery's premises. Even if a cemetery's land is part of a progressive development, contractors are required to have the cemetery surveyed and set aside from construction. This was done in the Gooding Cemetery's case. The remote cemeteries which are still in use like the McAllister and Robinette, as well as those that are no longer used like the Busby and Pickard, must have access lanes through private property so that township trustees can maintain the grounds and the living can pay their respects. 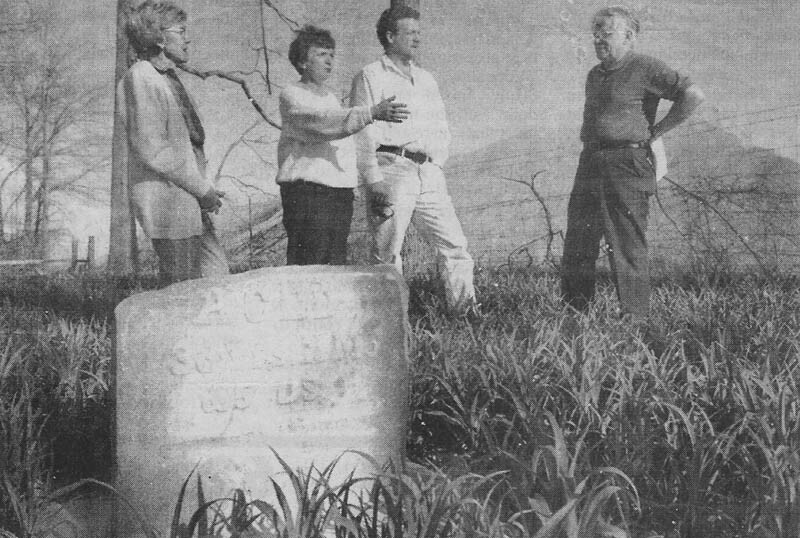 A Brian Drumm photo from a 1980s unidentified newspaper shows Madison County Cemetery Commission members from right to left John Brundage and Rob Hains, at far left Charlene Daugherty, with Fall Creek Township Trustee Sandra Huntzinger, middle. The picture was taken after restoration of the Seybert Cemetery in Fall Creek Township. The Seybert sits in the middle of the IMI Stone Quarry; a large pile of stone is evident in the background. Before the laws, some family graveyards like the Harmeson were forced to give way to progress. The Harmeson's once secluded location is now the middle of a housing division. At least the earth holding Harmeson family and friends is fenced and identified, and now a stone tablet lists those interred there. Other private graveyards like the Thomas Pendleton family plot and the Hartley were destroyed and built over. The exact number and identity of those buried in each have been lost. However, the Seybert might well have suffered the same fate had there not been state laws. Fenced and protected, the Seybert is now in the middle of an IMI gravel pit. Among all the gray stone is a bouquet of the Seybert's green trees. The once secluded Beech Grove church burial ground finds itself in the 21st century as part of commercial development, but by Indiana state law there can be no construction within 100 feet of its borders. W. Lloyd Scott, the first chairperson of the MCCC, is shown here at the Bunker-Davis Cemetery, examining the gravestone of his ancestor who came to Madison County in 1827. This photo by John Epperson was part of 'Signs of Early Settlers Abound on County Sites,' an article in the special "Madison County Sesquicentennial 1823-1973" edition of The Anderson Herald, Wednesday, September 19, 1973. When the county was changing from pioneer settlement to industrial development in the late 1800s, there had been a few instances where respect for the dead was heeded. The city of Anderson is to be credited, for when progress was encroaching upon its first burial grounds, officials had most of the graves moved to the new city cemetery, now named West Maplewood. Another instance of consideration would be the Waymire Cemetery's story. When the first state roads, now designated as county roads, were being planned in the 1840s, developers constructed CR 1400N so that it would jog around the Waymire, one of the first cemeteries in Duck Creek Township. However, more often than not, before the protective laws, a cemetery was completely obliterated to make way for progress as illustrated by the Alexandria Graveyard which has been paved over, the Cowgill now under the Summitville Middle School, and the Vandevender lost near a railroad track. Indiana House Bill #1345 allowed the Madison County Board of Commissioners not only to appoint a cemetery commission but, as importantly, to levy taxes in order to fund cemetery preservation. The Board appointed W. Lloyd Scott as the Madison County Cemetery Commission's first chairperson. Scott was a logical choice since he was a leader of the historical society's efforts to improve cemetery conditions. Scott went on to draft the MCCC's mission statement and guidelines. It was Scott who set the tone of the MCCC by stating, "Restoring and preserving mean more than just mowing." Scott along with four other volunteer members of the first MCCC in 1973--Frank Rogers, Mrs. Cecil Hensley, David Hayward, and Mrs. Glen Tyson--tackled the overgrown, neglected, and sometimes vandalized Gilmore, Crosley, Old Perkinsville, Walker, Carr, and Bunker pioneer burial grounds. Since Scott's time, other MCCC members have taken up the mantel of preserving this important part of Madison County's historic, cultural, and genealogical heritage. Speaking of archives and Hoosier heritage, on SR 135 along the southern boundary of Brown County State Park and just east of the Story Inn within the hamlet of Story is the Indiana Historic Marker explaining the "10 O'Clock Line." This was the name of the northeastern boundary of the lands purchased from the Miami Native Americans by territorial governor William Henry Harrison September 30, 1809. Nine years later, this line would form the southwestern boundary of the "New Purchase." The eastern and southeastern boundaries had already been established by previous treaties. The New Purchase, from the St. Mary's Treaty of 1818, opened for settlement to whites the central section of Indiana which includes what is now Madison County. The descriptive name, "10 O'Clock Line," is in the parlance of frontiersmen and Native Americans. As the marker pictured below explains, the line follows the shadow made by the sun at 10 o'clock on September 30th. The boundary in modern terminology starts near Montezuma, Indiana, on the Wabash River and runs southeast to the mouth of Raccoon Creek near Seymour, Indiana. 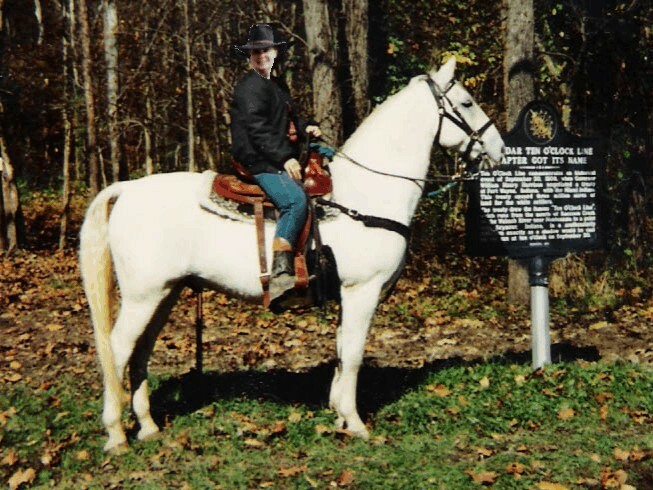 Taken (1998) four years before appointment to the Madison County Cemetery Commission, the picture at left shows Melody Hull on her favorite horse Jan having just ridden trail "E," which runs south from the Brown County Horseman's Campground to Story and the Indiana Historic Marker. Already interested in Hoosier history, Mel did not realize at the time that she would be authoring a web site years later on the Madison County pioneer legacy and digging through photo albums for this illustration. 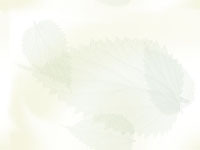 Send e-mail to thull@iquest.net with questions or comments about the site.